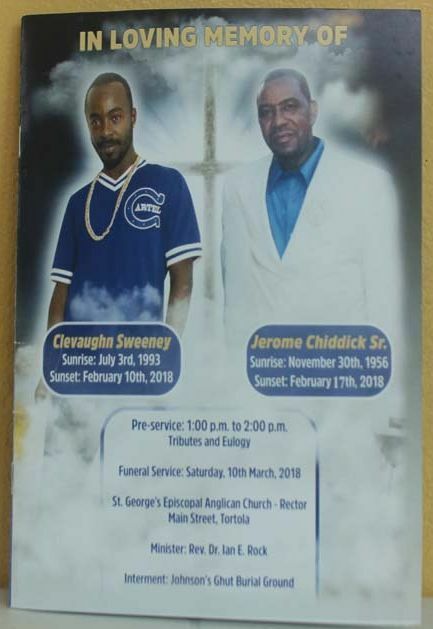 This is according to Honourable Myron V. Walwyn (AL), Minister for Education and Culture, during the reflection at the funeral service of Clevaughn M. Sweeney and father Jerome N. L. Chiddick on Saturday, March 10, 2018 at St George's Episcopal Anglican Church, Main Street, Tortola. 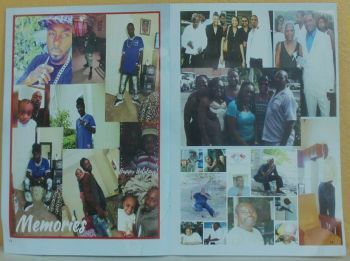 Clevaughn M. Sweeney, 24, was brutally murdered on February 10, 2018 in the vicinity of Althea Scatliffe Primary School (ASPS) along with Michael Stevens, 26. Hon Walwyn believes that the community is not showing more disdain for crime in the territory, while adding that the community should not wait until it is at their door steps to do something. 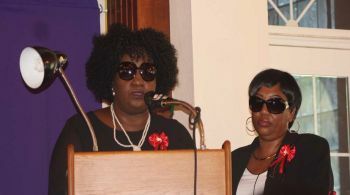 "As a community we must show our contempt for crime in this country, because I do not believe we do it enough. We cannot wait until it is on our door steps to do something about it or say something about it," emphasised the Education Minister. "Do the honourable thing & turn them into the police"
Hon Walwyn urged persons within the community to do their part to assist the police, while stating that the "police can't do that work on their own". He said, "Those of us who see what's happening and those of us who even have family members that are doing these things, do the honourable thing and turn them into the police, because its only a matter of time before the same thing happens to you." "We struck up a very good relationship"
During the reflection of Sweeney, Hon Walwyn lamented that they created a "very good" relationship, adding that Mr Sweeney would check in with him before he did anything. "He would seldomly make a move unless he checked with me and he would call me Boss," he said. The minister further lamented that Mr Sweeney expressed to him that he was dating a young lady name Arianna Wheatley, with whom he "shared a special bond" which later resulted in him becoming a father to Cali-Monte Sweeney, which he said "changed Clevaughn's life for the better". Hon Walwyn told the church that he made a pact with Mr Sweeney and Michael Stevens that if they needed someone to talk to or feel they were going to get into trouble, they should come and see him. "I had the privilege of seeing Clevaughn progress in life. He was a lovely, lovely young man with exceptional promise and had a lot of respect for others. May Clevaughn's soul rest in peace but may his killers never rest until they are brought to justice," expressed the minister. Meanwhile, Jerome N. L. Chiddick, father of Clevaughn, was diagnosed with lung cancer on February 7, 2018 and one week after his son's death, Mr Chiddick passed away on February 17, 2018. He was described by his sisters during his reflection as a loving, kindhearted, dedicated father and friend. In addition, he was said to be very jovial and a mentor to anybody he came in contact with. "He had a love for family overall. His loving, caring, comedic nature will never be forgotten. We will miss him greatly," said one sister. Here who taking this ball head man who bring our country to zero who has help destroyed we BVI now on here talking s#!t. Condolences to the family and friends. No one shouldn’t have to Put their love ones to rest at a young age either by natural causes or other means. I do hope the family finds strength in this difficult. My honest hope will be for us having a parenting community again and look after each other communities as we (once) did. I pray our youngsters both male and female make better and smarter choices in life. Please don’t let your background, last name, culture, religion or complexion be the reason why shouldn’t give life a fair try (But) let it be the reason to step out and give life a try. To the youngman and woman people who’s amazing just lacking support but (positive) (but) profile as a nuisance to our community, Please show yourself and and the community different. Give it your best shot. Working hard and honesty helps. But wasn't it just the other day you were one of those who were profiling the young women and putting the blame on them as being the reason why the young men are going down the wrong path....don't you remember? Think you said they have "ratchet lifestyles "
@to Gumption. Like most people you misunderstood my post. However I’ll encourage them to do better for the ratchet and negative lifestyle just ain’t working. Our youngsters are in massive need. I will do my best to encourage them but I won’t support the bad things most are doing. However let’s work together on solutions to better our community. I find it disturbing that the minister stated that Sweeney would call him before making any moves. I am not going to Pass judgement on anyone but it was common knowledge in the community that those young fellows were not all good if you get my hint...but as usual in the BVI we turn a blind eye to the wrong doing of certain people. Not disturbing at all. Many young people need and seek out an adult ear on which to bounce ideas off and to listen. Someone who wnt be judgmental or critical. Could be a relative, A close friend or a trusted mentor, Based on The Minister,s comment, it strikes me that the young man may have had personal issues and faulty influences around him and was being careful not to be going in the wrong direction. I could be wrong but this is my take on the Minister's comments. I grieve for my BVI of yesterday , yesterday PRIOR to its " building up" by those who are stematically and willingly sacrificing their lives and freedom to tear it down. Tear it down in order for it to be on that familial rosterr of " undesirable" place in the sun. Your silence and the silence of other expatriates and their social and religious organizations are all deafeng silence on the obvious source of the vast majority of violent crimes in the VI. No apology and no denouncement or condemnation. I attribute your silence to a desire for votes at any cost, in order that you may achieve a goal of ultimate power within the VI and its government. I have admiration for your efforts in other areas, but, regarding the disproportionate offenders of violent crimes in the VI by expats and their children , you have failed. The future of the VI under your leadership, in my opinion would be in harms way. I think your comment is ridiculous Whoa. I agree with what Waylon said. I will agree with you on that. And he seems proud to state that the guy used to call him before making a move...Like wtf? Myron is a good man but he along with These other Ministers are so afraid of the Back Benchers. The truth is the back benchers can throw this place into a head spin..upside down.. and all those ministers and their power be gone in a twinkle of the Eye...im not zdvertizing or encourging them to do it. The back Benchers Either dont have the courage or self confidence.. Or maybe they think this is the best of the bvi and is contented..After Election they are going to wish and sorry they didnt do what they had to do..
Hush cause you're probably one of them. Do you think the G4L that they were promoting is a "tennis club" or "basketball club". We in the BVI need to stop turning a blind eye to what is obvious. If you check the comments under almost all the shootings you will see that same G4L being mentioned even the shooting in WEST END(someone even went as far as to call Mr.Stev_ns name in that shooting), so dont pretend that these guys were saints who gathered in groups to read Bible versus. Perfect example is lot of young men in District 1 and families. Santa Claus picking from elsewhere to make them lazy comfortable and dependent in return for an x in the right spot on the ballot. Sad future indeed. Lucky to have had a mentor is what I think. If more of the youths had this type of guidance and support perhaps they wouldn' t need the friendship pf the negative so called friends who themselves are headec to cell block. We hear so often about being involve with youths and now we have the negative comments from the dirty minds. Some of you people on this island will never change your ways of thinking.ignorant to the bone. Seems as if u were there for this young man. In spite of that,violence found him. Don't feel bad. You win some, you lose some .